Early last year (2018) … my wife and I made a choice to start hacking my paycheck. You may be asking what does that exactly mean? Well, it means we are using the many tools we have available to optimize our income. For example, after reviewing the most recent tax code back then … we realized it was possible to lower our overall tax obligation. This meant more money stay in our pockets that could be used to grow our wealth. For us … more money from our paychecks means more invests that compound … which gets us to our financial independence number sooner. Today I would like to summarize the steps we took last year and continue to tweak so optimize our income. Below you will find the 7 steps we are using to hack my W2 paycheck. We are using the current tax code and tools available to us (retirement accounts) to lower our current tax obligation. I wish I would have caught on many years ago to this important life hack. But instead we found out last year (2018) and have been leveraging this information ever since. Hopefully you will get some inspiration to do the same by reviewing these steps. The first step I used to hack my W2 paycheck was to calculate our FREE Money. You can check out the resources I have provided below for more information on calculating your FREE Money. But to summarize … it is the amount of taxable income you can earn without paying any federal taxes. Keep in mind … this doesn’t really work for your state taxes … the calculation can only help you with your federal taxes. Note – This calculation should be run for each calendar year. So our FREE Money in 2018 is not exactly the same as in 2019 and won’t be the same as 2020 and beyond. So step #1 was to calculate this number … before we even considered how to invest our income. The next step that I took was to start exploring tax advantage accounts through my job. I make a low six figure income … and my wife stays home to help raise our kids. 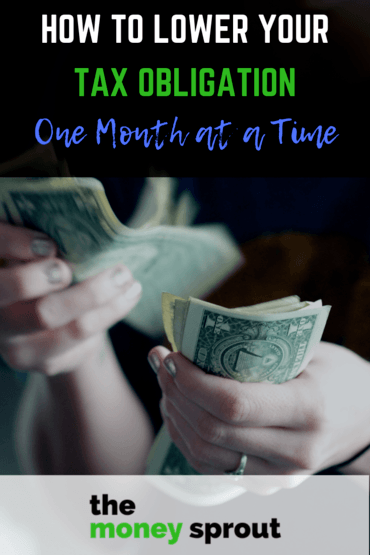 As my income slowly grows year after year … I think more and more about the tax bracket we are in and how it impacts our finances. Calculating our FREE Money helped last year because I knew if we could plan our taxable income to fall below $77,175 … our tax rate would be 0%! So with a six figure income … I needed to come up with a plan … which is when I turned to tax advantage retirement accounts offered by my employer. Every job and employer is different, so I can’t speak to all situations … only what is available to me and what is offered through my job. The main goal here is to eventually lower my taxable income … thus reducing our tax obligation. Right off the top of each paycheck … my employer takes out a mandatory 6% to help fund my future pension. That helped to lower my taxable income immediately. The next step for me was to explore other options to bring my taxable income down even more. Since I am under 50 … the contribution limits for me when I first setup this account in 2018 were $18,500. This year (2019) they have increased to $19,000. By leveraging one of these different options, I could lower our taxable income by up to the contribution limit for that particular year. Once I sorted through all the options offerred by my employer … the next step was to pick a plan and enroll. I ended up choosing the 457(b) plan at work based on the fee’s and investment options. So in 2018, I calculated that contributing around $12,000 to my 457(b) account … we would likely get below our FREE Money number. We ended up contributing $12,905 to the plan … which gave us some wiggle room. Now in 2019 our plan is to max out our contributions up to $19,000. This will open up the opportunity to earn additional income through other side hustles and still fall within our FREE Money. Note – The contribution to my workplace 457(b) plan are automated with each paycheck. I calculated how much should be taken out of each paycheck over the course of the year and set it up one time. The next 3 steps in our plan (#4, #5, and #6) to hack my W2 paycheck are repeatative in nature. Meaning I am continuely adjusting the numbers and tweaking how my paycheck looks each month. Based on our FREE money calculation last year, I was 99% confident in our numbers … which meant we wouldn’t have to owe any federal taxes. But starting out, I wanted to make sure we had some dollars taken out of my paycheck every month … so we didn’t get penalized for underpayment. As the months started to go by though it was clear we were on the right track. So I started to tweak our W-4 allowances up a few different times (3 times last year and 1 time in 2019). This meant more money coming in to us in our paycheck and not being taken out for federal taxes. We don’t just invent in tax advantage retirement accounts. So the extra income each month can be used to help build our taxable dividend portfolio. Just to put some perspective on our W4 allowances … in 2018 we will likely get back over $4,000 from our federal tax return. That means we overpaid by a lot during the year. We still get the money regardless … but not when I am paid. So we are constantly tweaking our W4 allowances to align with our overall goals. After setting up our plan in 2018 to hack my paycheck … I received two small pay increases. One was a market adjustment and the other an annual cost of living increase. Both times I immediately went and adjusted our 457(b) contributions higher to pull in this extra income. 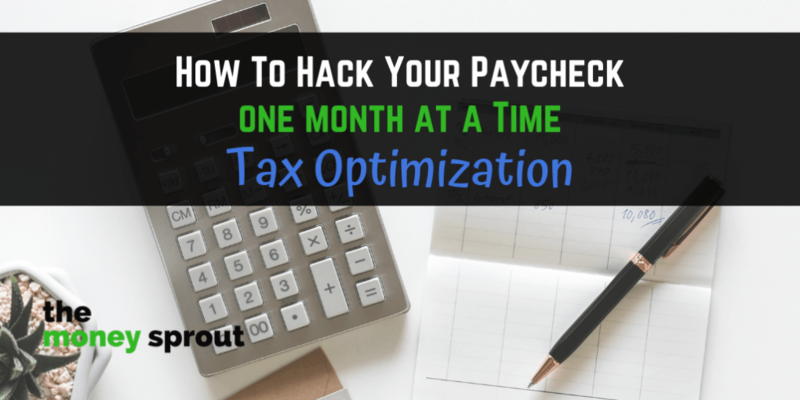 If you are not yet at the maximum contribution limit … I think this is a necessary and important step in hacking your paycheck. For those who are at their contribution limit ($19,000 in 2019) … it may be time to look for alternatives (see step #7). The important thing for us is to stay below that FREE Money number by using the tools available. This step is an annual one … when contributions limits are adjusted higher for retirement plans. If you are not contributing the maximum amount already, then you can probably skip this step. However, if you contributed the max in 2018 ($18,500) to a retirement plan … then you can adjust your 2019 contributions up by $500 (to $19,000) for the new year. These little steps and tweaks are what can make a huge difference over 10, 20, or even 30+ years. Last year (2018) we were able to contribute about $12,905 to my workplace 457(b) plan. This was enough contributions to ensure that our federal tax obligation for the year was $0. Now in 2019, we are setup to contribute the maximum contribution limit of $19,000. That will still keep us well below our FREE Money (see #1) … which will help keep our tax obligation at $0 in the current year. While all these things are going on … my wife and I are exploring other options to increase our income. We are starting to earn a little profit from our blogs … which will be considered ordinary income. There are other options we are exploring for increasing our income. All the while our dividend income stream continues to grow every year … from taxable and tax deferred accounts. As this income grows we want to make sure to stay under our FREE Money. That is where other tax deferred accounts could eventually come into play. For example, I could open up and max out a 403(b) plan for another $19,000 of deferred W2 income. We could also switch from contributing to our Roth IRA accounts to traditional IRA accounts for even more tax benefit. For our situation … this step is constantly being tweaked and re-worked for future plans. After reading the steps above … you are probably thinking I am anti-taxes. That isn’t necessarily true. My wife and I have paid plenty of taxes over our lives (a lot in fact). And we continue to pay other taxes (state, payroll, property, sales, etc.) and will still in the future. Hacking our paycheck to lower our tax obligation doesn’t mean we won’t ever pay federal taxes again. We are just putting more of our income in our retirement accounts so they can grow and compound. Eventually, we will likely pay taxes on our gains from these accounts. There is nothing illegal about following these steps. We are being smart about our money and income earned and where it is utlitmately going. We are simply using the current tax law to optimize our income. How do you hack your W2 paycheck? Do you take advantage of all your tax advantaged accounts available to you?